Allegro Medical presents the Stable Rail. Designed to accommodate both in-home and hospital beds, the Stable Bed Rail from Stander keeps you in bed when needed and assists you out of bed when it’s time to arise. The two non-slip legs plant firmly on the floor for extra stability and support when getting out of bed. 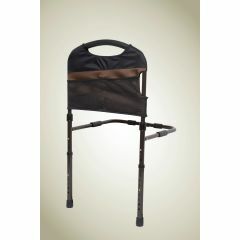 Setup and adjustment do not require any tools so the Stable Bed Rail can easily be customized it to meet your needs. Four pockets are sewn into the cover of the Stable Bed Rail to maximize storage space. Wow. My Rollarator just arrived this morning and that is barely 24 hours after ordering it. What service! And it is beautiful, easy to complete the assembly and I can't wait to go to the mall with it. You are the best! I needed 1 ml syringes (monoject). I have 2 sick parrots and vet only gives you two. Everywhere on the web wanted me to order a huge amt.You had what I needed at a great price and I received them in three days with reg shipping.BTW my cockatoo had MRSA!They are both still sick. I'm an RN, glad you're around.